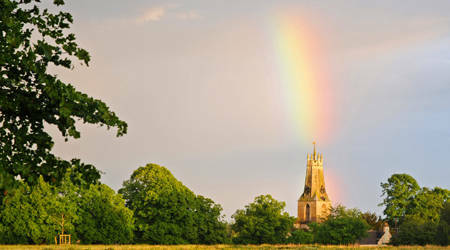 This is the moment a pretty English church received a blessing from the heavens – when a rainbow beamed down directly onto its tower. Amateur photographer Ian Peters, 63, captured stunning spectrum of light as it flooded onto Holy Trinity Church in Minchinhampton, Glos. Mr Peters, of nearby Rodborough Common, spotted the remarkable scene as he drove past the village following a heavy thunderstorm last month. He said: ”I was just driving past and it was staring me in the face. It was the result of being in the right place and the right time – and having my camera. ”While there are so many disasters going on in the world, it’s lovely to have something positive to look at. Holy Trinity Church was built in the mid 12th century but its spire was pulled down for safety reasons in 1863 and replaced with a coronet structure.